Today we leave the Pelion and drive first to Volos where we drive into the center to look around. According to the myths Jason left here looking for the Golden Fleece and there should be a replica of the ship the Argo in the port with which the Argonauts went searching for the Fleece. Today we do not see the ship but a lot of yachts, there is quite some money together here. Volos is a modern city with a long boulevard along the water where plenty of restaurants and café's can be found. A nice place for a cup of coffee. We do not feel like visiting the museum and drive out of town after having coffee and a walk. We do not have to go that far and therefore avoid the motorway. At Aerino we see a grave along the road. In the beginning of the 20th century there was already a settlement from the New Stone Age found here, but only with the construction of the highway between Athens and Thessaloniki extensive excavations were carried out, and the finds included tholos graves from the so-called protogeometric period (11th and 10th century BC). The area has been inhabited for at least 7,600 years. Then we drive to Glyfa where we buy a ticket to Agiokampos on the island of Evia, after Crete the largest island of Greece. Evia is how you pronounce the name but the Greeks write it as Εύβοια which is very similar to Euboia or Euboea as it is often written in Western Europe. But the β is nowadays pronounced as v and the ύ in this case also, so Evia or Evvia seems to be the best translation (according to Teije Efja with the emphasis on the 1st syllable would even better). When you say Euboea to a Greek, they really have no idea what you're talking about. We still have some time left and we look around for a while for the kastro, or castle, which should be nearby but we do not find anything. Then we go back to the port where we have to wait for the boat to take us in 20 minutes to Agiokampos, a port in the north of Evia. The island is more than 4,000 km² large but is not really known as to foreign tourists as an island, it is mainly Greeks who go on holiday here. At the capital Chalkida the island is connected to the mainland by bridges and from Athens the island is easy to reach. We drive a long stretch along the northwest coast but do not think it is very interesting or beautiful. The villages look somewhat neglected and there is a lot of junk on the beaches which we have not often seen in Greece. Then we head south where we have rented an apartment near the town of Elia. It is hot today, about 35 degrees and just now we have the bad luck that we first have to walk down a steep road with all our luggage and then go up a long and steep staircase. The third time we drift about more than we walk. First thin g we do is to turn on the air conditioning! We would have a kitchen and a refrigerator but I can not find anything at first. Until I open a cupboard and yes, there is the whole kitchen with sink, stove, refrigerator and tableware. They did a nice job hiding it. Below us we see the swimming pool of the complex and in the distance the beach but we are not going to walk with this weather all the way down so we have to climb back later and drive by car to a beach where we can cool off in the water. It does not help that much because when we are back we have to go up that steep road to the room again in the heat. In the evening it does not cool down at all and if there is any wind, it is somewhere behind us because on our balcony there is none. Teije is sitting on the balcony, sweating, while I stay inside with the air conditioning turned on high. The next morning it is even warmer than yesterday and we first look for a restaurant with air conditioning for a cup of coffee in the nearby village. And after that we go for an hour to the beach before we get in the car for a tour around the north of the island. 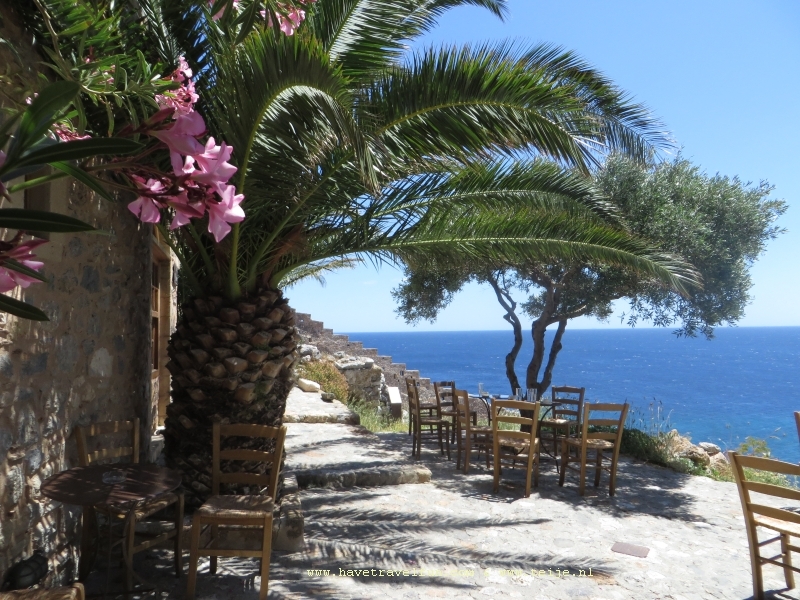 On the east coast, under Psaropouli, we see on the beach a natural rock where some trees grow and where a chapel is processed. There is even a flowerpot on it. The whole island is hilly to mountainous and very green. The highest mountain is more than 1,700 meters and you can ski in the winter. The north is also called Little Switzerland with wooded hills but due to the lack of running water it is less beautiful than it could be. Just like in the Pelion, it takes quite some time to get from one point to another. It is too hot for hikes in the mountains so we stay first on the east coast where we see a few beautiful beaches and of course also go into the water for some time. Then we cross the mountains again to the west coast where we go to Limni, a very nice village with narrow streets. From a terrace we look at how a bus runs through the narrow alleys against the oncoming traffic. The village is built against the hills but we quickly give up when we try to limb through the village and prefer to find a next terrace. It is so hot and somewhat stuffy. Fortunately, there is some wind here. With this warm weather we are in no hurry to go back to our apartment because we know that it is even worse there. We walk once more along the boulevard and see a statue for Lela Karagianni, a resistance hero of the 2nd World War who was executed by Germans a month before the end of the occupation. The Greeks love their heroes and heroines. Although she spent most of her life in Athens and she was shot dead in the Haidari concentration camp just outside the city, she was born here in Limni. On our way to our apartment we stop in the villages that we encounter like Rovies where a beautiful beach lures us to go into the sea again. At our apartment it is even more oppressive than yesterday and we go back to the village of Ilia with the car because at least there is still a little wind. And according to the weather forecasts we get a real heat wave, that is with temperatures above 40 degrees. Despite the heat we want to see something of the island and not just from the car or the beach so we drive in the morning to Chalkida or Chalkis, the capital of the island. Along the streets in the center all parking places are occupied but then we are beckoned by the guard of a guarded parking lot. For a euro per hour the car can stay in the shadow. A few minutes later we are on the sun-drenched boulevard of the modern city. Some 90,000 people live here, a lot of them students. And many Athenians come here for a weekend or a longer holiday. Chalkida seems to be a lively and trendy city, but today everyone is looking for the shadow and we are looking as much as possible for it, too. There is a castle on a hill and it seems to be a nice climb but we are not going to do that, it is way too hot. We walk along the boulevard and the side streets with all kinds of nice shops. One of the sights is the Red House where formerly people of nobility lived but we do not find out why it is supposed to be such a landmark. The archaeological museum with finds from the island is worth it but for the excavations themselves, some distance outside the city, we find it too hot. We do cross the modern bridge and visit the old one that bridges the 40 meters narrow of Euripos that separates Evia from the mainland. Under the old bridge the water flows very quickly with sometimes high waves, depending on the position of the sun and the moon and every six hours the direction of the flow changes from north to south and vice versa. The phenomenon was already a mystery to the ancient Greek scientist and philosopher Aristotle, who spent the last years of his life here, and scientists still do not understand the phenomenon. After 3 hours we feel we have seen enough and get into the car with the air conditioning on the highest level. We drive to the east coast where we found a nice beach at Angkali yesterday. We first look for a terrace for a drink and then put our towels on the beach. Usually I spend longer reading on the beach than I go into the water but today it is so hot, almost 40 degrees in the shade, that I go into the water every few minutes. And the best part is that we almost have the beach to ourselves, it is very quiet. The Greeks prefer to keep siesta at this time of day and usually go to the beach early in the morning or late in the afternoon. The quickest way back to the west coast brings us back to Limni and there we eat something near the water. Just like yesterday, we stay for a long time in the village so that we do not have to go to our apartment, it is probably even more muggy this evening than the last few days. It is a great place and not expensive at all (29 euros per night) but there is no wind and the heat seems to accumulate. We leave the day after tomorrow and wanted to go to the south side of Evia for a few days, but because it is going to get even warmer, we are now looking for cooler places on the internet. We have to go to the west of Greece where it will be 35 degrees at the most. Oh, that sounds good. We want to discover at least 1 new Greek island every year and this year we chose Evia for it. But we haven't seen anything of the south of the island so we will have to come back here one day. It is indeed even warmer today than yesterday and we drive first to the village of Rovies, just south of us. There we drink coffee and make a short walk where we see a medieval tower with a monument with the text "It is never too late" what we think is more beautiful than the many warlike monuments scattered throughout the country. And after that we have only one destination: the beach! Fortunately, our skin is already used to the sun and we will not burn so quickly because we can best spend this day in the water and on the beach, but also as much as possible in the shade. At the end of the day we stop extensively in Limni, the place where we have spent most time in the past few days. It does indicate that we feel most at home here. Teije sits there with pinched eyes because he refuses to wear sunglasses which, of course, is not really smart with the bright sun. Tomorrow we have a long drive ahead but we go to bed late. Around twelve o'clock it is still almost 30 degrees and although we love warm weather, we are happy that tomorrow we go to cooler regions.